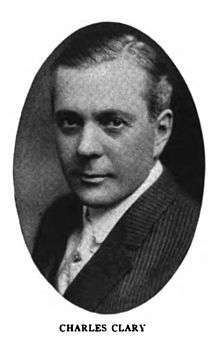 Charles Clary (March 24, 1873 – March 24, 1931) was an American actor of the silent film era. Clary appeared in 206 films between 1910 and 1930. He was born in Charleston, Illinois and died on his 58th birthday in Los Angeles, California. ↑ "Charles Clary". The New York Times. Wikimedia Commons has media related to Charles Clary.